Are you ever in a quandary with what to do with all of those bits and pieces of fresh vegetables in the refrigerator bin? I am . . . all the time. When I made the Mediterranean Cod, I had leftover different colored bell peppers, cherry tomatoes, part of a purple onion. They were all in the fridge waiting for a recipe so . . .
. . . Spicy Peppery Couscous was created. Pearl couscous is a staple at our house. When we make it, we always use broth for the liquid and then just because we like spicy . . .
. . . we stir in a can of diced tomatoes with jalapeños at the end. The additional liquid from the tomatoes is magically absorbed by the couscous. This addition gives the pasta a zippy taste. If you don’t like zip you can make the couscous with just plain broth–and if you are a vegan you can simply use vegetable broth. This dish is very forgiving — you can throw it together a lot like fried rice. 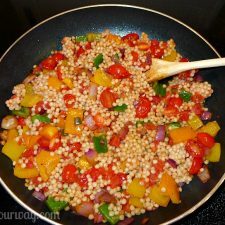 Add any kind of fresh vegetable to the pearl couscous and it will turn out. I made the couscous one evening knowing that I would be using it the following day. I just put it in the refrigerator until I was ready to use it. The following evening I cut up all of my vegetables, sauteed them for a minute or two in a skillet with a little olive oil. As I added the couscous to the vegetables, I used a spatula to break up the pasta clumps. Yes — it does clump. Cooked couscous has a tendency to stick together once it cools but it breaks up easily. This is such an easy side! It looks great. It tastes great And best of all it can be put together in no time at all. It was the perfect compliment to our Lemon Garlic Chicken. Very colorful couscous dish made with broth and finished with Ro-Tel tomatoes giving it a spicy taste. Chopped fresh vegetables such as colored bell peppers, cherry tomatoes, purple onion are added giving it a confetti appearance. Bite-size pieces of fresh vegetables such as:1/2 red 1/2 orange, 1/2 green,1/2 yellow bell peppers, 1/2 purple onion, 1 cup cherry tomatoes halved -- this is what I used but you could also add mushrooms, scallions -- whatever you like. In a saucepan over medium heat lightly brown the couscous in the olive oil stirring frequently. It will burn so be careful. When it is lightly tanned add the hot broth to it, watch out for the steam. Turn the heat on low and put a lid on the pan until all of the liquid is absorbed, about 5 minutes. Add the whole can (10oz ) of Ro-Tel tomatoes to the couscous and stir. Put the lid back on the pan and set it aside. Once it is cool you can either put it in the refrigerator to use later on or proceed with the recipe. Cut the peppers in bite-size chunks. Add 1 Tablespoon olive oil to a large skillet and heat at medium-high. Add the vegetables and saute for 2 minutes. The vegetables should still be firm and retain their color. Add the couscous and stir until the vegetables are mixed in. Serve immediately with prepared protein. 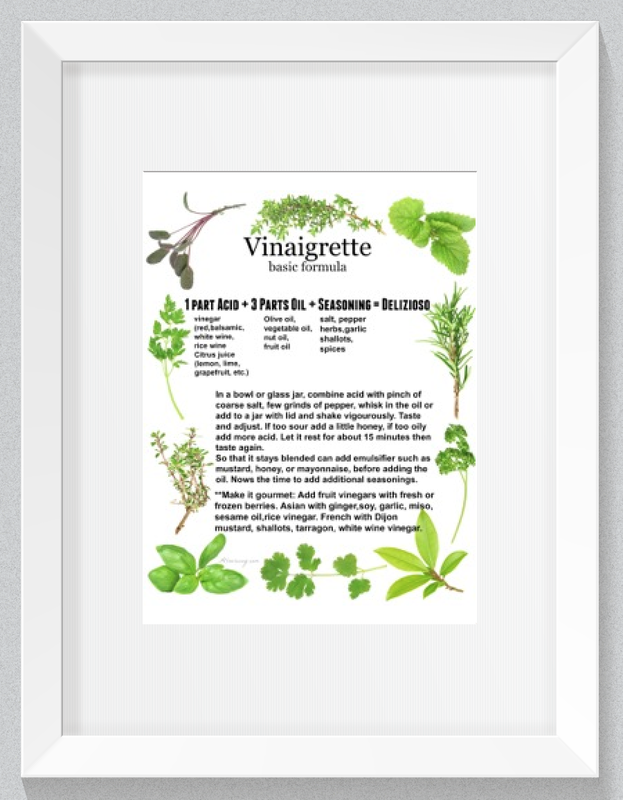 Note: Recipes and content from All Our Way ©2014 is copyright protected. Please do not use content or recipe without prior written permission. If you want to share the information please link to the post. Thank you. This is the type of thing I do all the time. We always have a variety of peppers laying around and I usually use rice or pasta. 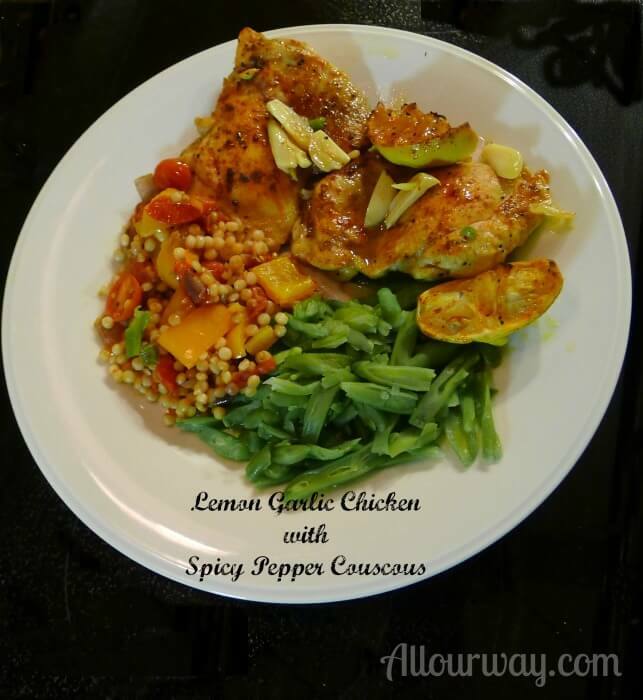 However I just noticed I had some couscous so I’m definitely going to give this a try this weekend! Looks delicious! I love spicy peppery stuff. This looks so good. 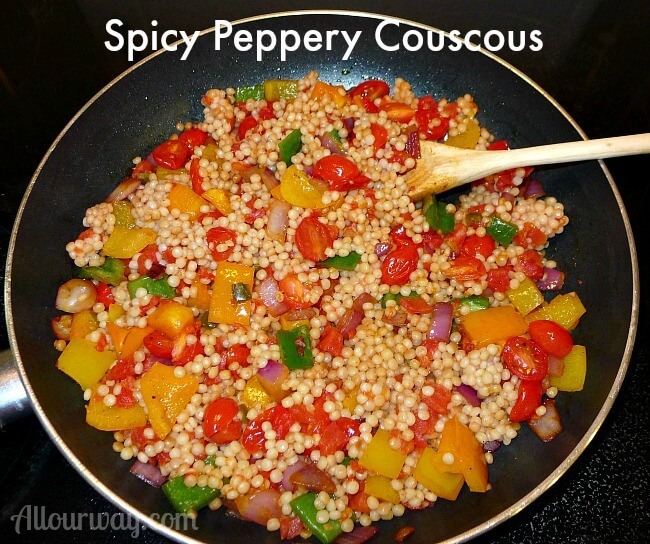 Love couscous and I often make it spicy just for me to enjoy. Can’t wait to try this Marisa. This looks so tasty! We have couscous all the time. And we cook it the same way all the time too….boring! Can’t wait to try it this way. Love how we can cook it like fried rice. Delicious looking dinner.Thank you for following my blog. I look forward to reading yours.